First of all, my apologies for being MIA for the last month or so. In my defense, Carissa (my BFF who I’ve mentioned in multiple entries) moved back to Boston and my heart needed to cry and be pathetic for a while. But, I’m back now and gifting you with my most delicious recipe yet! So, let’s all move on and eat some zucchini cakes. 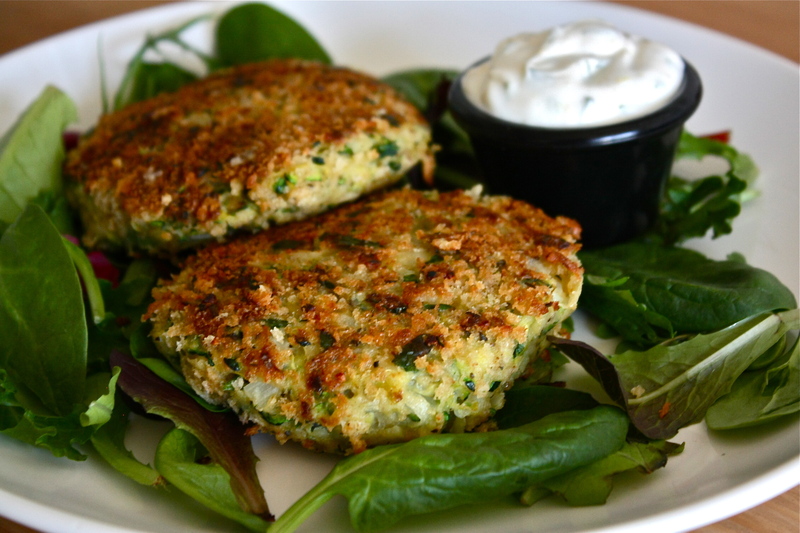 This is a great vegetarian alternative to crab or salmon cakes for all of you living by Bruce the shark from Finding Nemo’s mantra, “Fish are friends, not food.” They’re super tasty though, so you’re still going to love them if you’re an omnivore, carnivore, or even a cannibal. That was gross, I’m sorry. If you can get them to be crunchy on the outside and fluffy on the inside, you’re going to be a happy camper. The key is to make sure you really squeeze all the water out of the vegetables before forming the patties. Otherwise you’re going to end up with a soggy patty and a frown. The lemon aioli lends a great tanginess to cut through the richness of the cake, and the potato make this a surprisingly filling dish. You can have them as an appetizer or serve em up between two buns as a burger. I actually used the leftovers for breakfast the next day to make zucchini cake Florentine. So bomb. I’ll put that recipe up soon. Ok, my mouth is watering. I need to finish this and put some food in my belly. First, make the aioli by combining all ingredients to taste. I used a 1 to 1 ratio of the mayo to greek yogurt. Store in the fridge. Trim the ends of the Zucchini and grate it. I used a cheese grater to do this, but it would be immensely easier with a food processor. Transfer the grated zucchini to a large mixing bowl. Peel and grate the potato and add to the bowl. Finely dice the onion and add to the bowl. Stir veggies well with your hands and transfer to a runway of paper towels and squeeze as much liquid out as possible. This step is SUPER IMPORTANT, so don’t be lazy about it. Once dry, transfer the vegetable mixture back into the mixing bowl. Beat eggs in a separate bowl and add to mixture. Add all remaining ingredients (besides the oil) and mix with hands until the texture holds its shape when you form patties. Add more bread crumbs, if necessary. Place the mixture in the freezer for 10 minutes to make it easier to form the patties. I used a 1/2 cup measuring cup to shape the patties, but you can use your hands, as well. Heat coconut oil over medium heat. When the oil is hot, place the patties in the pan and cook until a golden brown crust forms. Flip and do the same on the other side. Place a cooling rack on a baking sheet and transfer the cakes onto it. Bake in the oven for 15-20 minutes until cooked through. That’s it! I am reading this Ditch at 6:30am and ready to make these! I will be doing just that this evening as we watch the Blackhawks vs Ducks game. Go Hawks!